Brokerage house bluewater reports another sizeable price drop on the 41.5 metre Mondo Marine superyacht for sale Tania T.
Her owner has reduced Tania T's price by more than €1.4 million this year alone to make sure she is competitively priced in her size range and will be the next 41 metre superyacht to sell. The latest reduction sees her price drop €900,000 down to an asking price of €5,490,000 (VAT paid). Tania T has been lovingly maintained by her owner and crew. Recent updates include having her hull repainted this year, a refit in 2011/2012, and she just completed her 10 year Lloyds class survey. Tania T was delivered by Italian superyacht builder Mondo Marine in 2002 and features design by Mario Grasso. Interiors by Aldo Cichero feature beautiful woodwork and Italian craftsmanship. The tri-deck motor yacht accommodates 10 guests in a five-stateroom layout including a full beam master suite and two full beam VIP staterooms. The master features a his-and-hers bathroom and office. Outdoor entertaining is provided handily with her large sun deck which hosts a Jacuzzi, bar and table for al fresco dining. Powered by twin 2,285hp Deutz engines, she has a transatlantic range of more than 4,000 nautical miles at 10 knots. Visits are encouraged. Tania T is lying in La Napoule near Cannes, France. 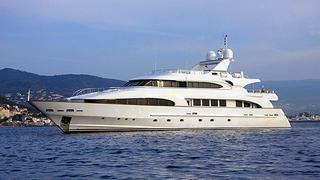 See full details, specs and a photo gallery of superyacht Tania T for sale.